You’ve heard of cool patterned tiles in the bathroom, but what about making a statement with your basin? Whether it’s for your downstairs cloakroom or your master en-suite, a snazzy basin is the perfect way to create a memorable focal point. From intricate patterns to standout colours, we’ve put together 10 of our favourite basins for bathrooms and cloakrooms. Featuring a delicate multi-coloured pattern on both the inside and outside of the bowl, the Adriana countertop basin from The London Basin Company is guaranteed to impress your bathroom visitors. Made from porcelain, the emerald green backdrop is complemented by a playful contrasting design of festive balloons. There’s no denying that pink is still having its moment. And what better way to integrate it into your home that with a contemporary basin? 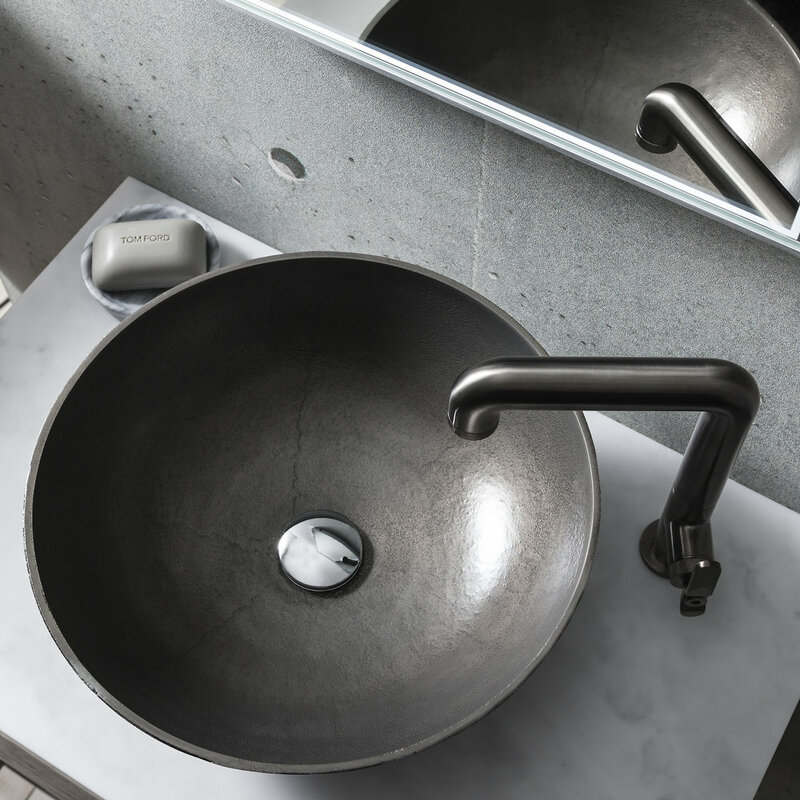 The Arla from Kast Concrete Basins looks stunning when paired with matte black brassware and an effortless Scandi aesthetic. A generous size at 400 x 400m, the Arla ticks all of our boxes for both practical and style reasons! Created in collaboration with artist-photographer Ashley Woodson Bailey, Kohler’s Dutchmaster collection takes ‘bringing the outside in’ to the next level. Inspired by the Dutch master paintings of the 17th century, the dramatic floral pattern sits against an alluring dark backdrop, making the basin a truly artistic statement piece for the bathroom. For those of you who have embraced the trend for copper or terracotta tones in your home, the Aubrey Basin from The London Basin Company is the perfect finishing touch to your bathroom scheme. Featuring a textured basket weave detailing on bowl’s surface, the Aubrey is a versatile basin choice that will help you to make a subtle yet impactful design statement. Combining the industrial trend with an easy-going colour palette, the circular Mara Basin in Ember from Kast Concrete Basins features a subtle geometric detailing on the outer surface of the bowl. Ideal as a cloakroom or smaller bathroom statement piece, the soft burnt orange tone looks perfect when paired with brass taps and accessories. Crafted entirely from natural stone, this countertop basin from Norwegian natural stone specialists Lundhs Real Stone will add a striking finish to a modern bathroom space. Made from Anorthosite, the Lundhs Antique stone was formed 1000 million years ago on the west coast of Norway, meaning if you’re lucky enough to have one of these in your house, you’ll have your very own slice of Norway in your bathroom! A beautiful, unique and eye-catching design, the Celestine Basin from The London Basin Company is shaped like a blossoming flower. Featuring a subtle crackle effect, this basin is the epitome of graceful luxury. If you’re looking to achieve an industrial look and feel in your bathroom, the Union Basin by Crosswater will definitely tick a lot of boxes! Crafted from solid aluminium, this metallic countertop design has a textured finish and works well in both light and darker schemes. For the ultimate wow-factor, take a look at Kohler’s Kamala Basin. Adorned in an elaborate pattern of ridges, dots and swirls, this vessel-style sink is inspired by ancient Southeast Asian tribal rain drums and is cast from a bronze that will deepen over time. A celebration of asymmetry, the Bol Basin by Roca is a great way to make a subtle contemporary design statement. A wide-rimmed freestanding bowl, the Bol will act as a stylish focal point in both master bathrooms or cloakroom spaces.